Dying in these areas can be a little problematical, resurrection points are few and far between. 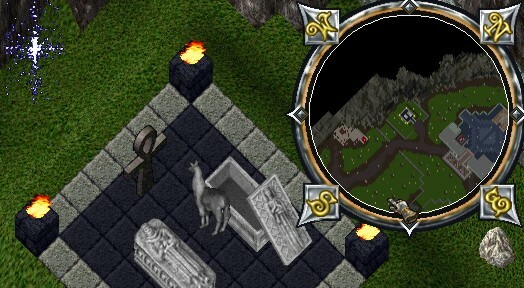 Just inside the entrance of Underworld from Fire Island Volcano is a memorial stone. This functions as an ankh allowing you to lock karma, resurrect and tithe gold. 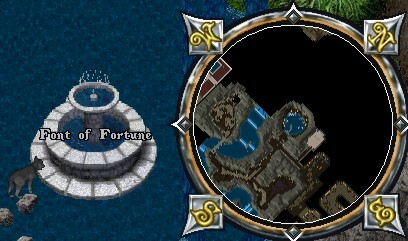 At the Northern edge of Underworld, beyond the gray goblins, is the Font of Fortune. This too offers succor to the fallen adventurer. 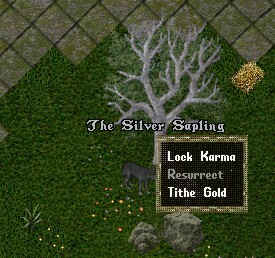 It does not, however, offer the chance to tithe or lock karma. 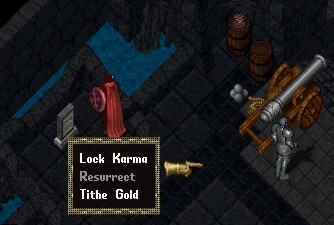 as an ankh, offering the opportunity to lock karma, resurrect and tithe gold. belongings. Double click your corpse to loot it. Each seed only works once. Further resurrection points are offered at the two champion spawn areas, each having its own ankh. 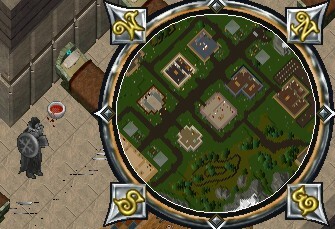 Both ankhs are to the far West of the champion area. However this choice is not without risk if the champion spawn is active. After progressing the primeval lich champ spawn to undead gargoyles and wights, the ankh on the roof of the mansion turns into an exact replica of the chaos shrine and sitting on the lich’s throne will resurrect you. This includes a message that you can get resurrected at the chaos shrine. Each of the peerless areas, Medusa and Stygian Dragon also have an ankh, however that is only accesible to characters who have used the keys and entered the closed area. Sacrifice virtue, Gem of Salvation and Gift of Life spell can also be of great use. 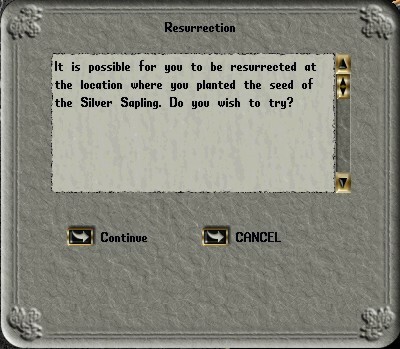 In Holy City (nightly undead spawn permitting) resurrection is offered by the healer. 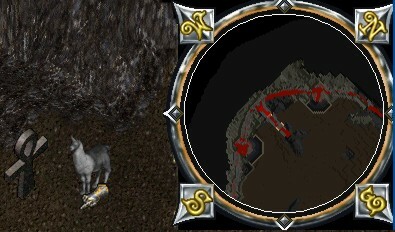 Finally, if all else fails, it is possible to run from Cavern of the Discarded to the healer in the Royal City and back before your corpse decays. This was inadvertently tested by the author.